A call to Arne Ploch at Camper & Nicholsons in Palma brings news that he's now taken over the central listing of Moonen's 26m motor yacht La Dolce Vita jointly with Michael Payne in the Monaco office. Built in 1999, La Dolce Vita offers excellent charter facilities and the comfort levels of a much larger vessel including an open transom with easy access to the water and an impressive range of 1900 miles. 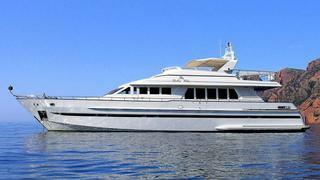 Sleeping six guests in three staterooms, she's asking €1.795 million and will be on display at the Cannes Boat Show.